Mars One has secured lead suppliers for its first mission to Mars. The mission, slated a 2018 launch, will include a robotic lander and a communications satellite. 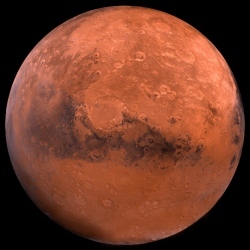 Mars One has contracted Lockheed Martin and Surrey Satellite Technology Ltd. (SSTL) to develop mission concept studies. The Mars lander will be built by Lockheed Martin and the communications satellite will be built by SSTL. The Mars One Roadmap is to land a crew on Mars in 2025 Mars One wants to use reality TV and advertising sponsorship to fund manned missions to Mars. Lockheed Martin will for $250,000 produce a "mission concept study" for an unmanned Martian lander that would precede the $6 billion manned mission. Britain’s Surrey Satellite Technology will meanwhile turn out a similar study, for 60,000 euros ($80,000), for a satellite that would hover in orbit over the lander and relay data and images back to Earth.